Overtown Farm, near Cranham in Gloucestershire, is a 560 acre fully certified Organic farm owned by the National Trust, and lies 970 feet above sea level on the Cotswold escarpment. 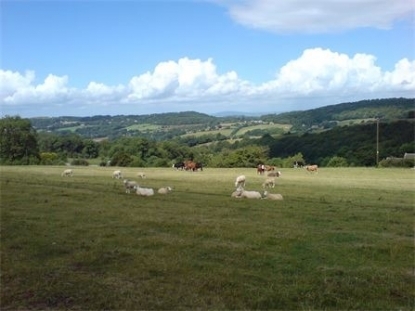 It overlooks the vale of Gloucester with a wonderful view of the Malvern Hills and the Black Mountains beyond. The farm is run by Martin and Pauhla Whitaker and has been farmed by the Whitaker family for over 60 years. The farm has been in various environmental schemes for over 30 years and is currently in a 10 year Higher Level Environmental Scheme (HLS). This involves managing the land to encourage, maintain and increase various target species by providing the sort of habitat that supports nature at all levels of the food chain. We regularly participate in Open Farm Sunday to invite the public onto the farm and see how we operate, and we also welcome school visits and other groups onto the farm for walks and talks during the year. To find out more, have a look at the Farming at Overtown page. Overtown has been a Soil Association certified organic farm since 2001 and is Farm Assured under the Red Tractor Scheme. We specialise in supplying organic lamb, hogget, mutton and beef from our own home-bred animals. We sell direct from the farm and from selected local outlets, and our prime aim is to supply high-quality meat, with the minimum of wasteful packaging, at a reasonable price, to local people who care about where their food comes from and how it is produced. Please click on the Our Organic Meat page to find out more.